The most unique aspect of living, raw food is its enzyme content. Enzymes begin to be destroyed when food is heated over 120 degrees Fahrenheit. Enzymes can only be found in living cells, raw foods, or food dehydrated at low temperatures. They are particularly beneficial for human health if they come from raw plant-foods, because plant enzymes provide the most action through various pH (acid/alkaline) conditions in the body. 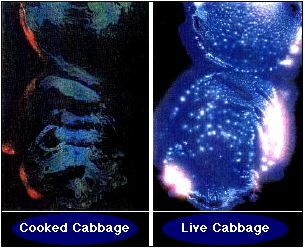 Google “Kirlian Images Raw Food” for more photos. When cooked food is eaten, the body has to re-identify the food, recode it with enzymes, and attempt to deliver it to the proper tissues and organs. This process takes energy and robs vitality. As our vitality decreases, cooked food drains away more and more energy, creating more digestive confusion. As a result, cooked food is often incompletely digested and not efficiently delivered to the proper tissue site. Eating food that has been heated above a certain temperature (slightly under 200 degrees Fahrenheit) causes a pathogenic response in the body called leukocytosis whereby white blood cells (leukocytes) are actually used to digest food much as they would attack a foreign substance. This has been confirmed in hundreds of experiments and is based on the research of the Swiss scientist Paul Kouchakoff.